Sir John Templeton, legendary investor, was famous for saying, "The four most dangerous words in investing are, 'This time it's different.'" He knew that though history doesn't repeat, not exactly, history is an excellent guide for investors. 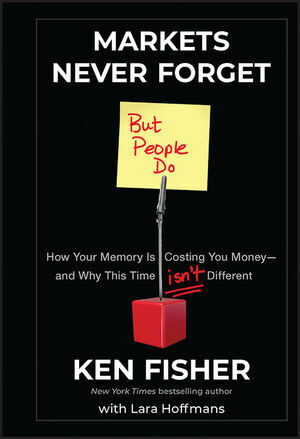 Ken Fisher is best known for his prestigious "Portfolio Strategy" column in Forbes magazine, where his over 27-year tenure of high-profile calls makes him the fourth longest-running columnist in Forbes's 90-plus year history. He is the founder, Chairman and CEO of Fisher Investments, an independent global money management firm managing tens of billions for individuals and institutions globally. Fisher is ranked #252 on the 2010 Forbes 400 list of richest Americans, and #736 on the 2011 Forbes global billionaires list. In 2010, Investment Advisor magazine named him among the 30 most influential individuals of the last three decades. Fisher has authored numerous professional and scholarly articles, including the award-winning "Cognitive Biases in Market Forecasting." He has also published seven previous books, including New York Times and Wall Street Journal bestsellers, The Only Three Questions That Count, The Ten Roads to Riches, How to Smell a Rat and Debunkery, all published by Wiley. Fisher has been published, interviewed and/or written about in many major American, British and German finance or business periodicals. He has a weekly column in Focus Money, Germany's leading weekly finance and business magazine. Lara Hoffmans is a content manager at Fisher Investments, managing editor of MarketMinder.com, a regular contributor to Forbes.com and co-author of the bestsellers, The Only Three Questions That Count, The Ten Roads to Riches, How to Smell a Rat and Debunkery.